This is a great little 24-page pamphlet, edited by the redoubtable Jack Lane and published by the also redoubtable Aubane Historical Society. It takes up the ongoing anti-IRA, anti-republican campaign being waged by supporters of the late Peter Hart, a Canadian historian who went to great (and questionable) lengths to present the west Cork IRA as being guilty of “ethnic cleansing” and sectarianism against local Protestants in the war of independence. Hart also made out that the IRA gunned down Crown Forces who had already surrendered at Kilmichael, in the famous ambush led by legendary IRA figure Tom Barry. The Festival organisers shied away from debating this stuff, and it was left to the Aubane Historical Society to challenge the anti-republican propaganda masquerading as objective history. Below is a pdf of the pamphlet. At the same time, please consider making a donation to the Aubane Historical Society and helping them with their very valuable work. Is the six-county state reformable? The People’s Democracy organisation (now Socialist Democracy) argued, from its start in 1968, that the northern state is irreformable. In June, following the Stormont elections, the Irish blogger “Sráid Marx” wrote about socialists and elections, arguing for a reformist movement that would open a space for working class politics to advance. The article contained many assertions that were not strongly based on evidence. Apparently by issuing a call to “Smash Stormont” we in Socialist Democracy had proved ourselves the worst kind of ultra leftists, opposed to any reform, even though our entire history refutes that claim. SM cast a vote for People Before Profit on the grounds that this was the way to build a movement that would go through Stormont in order to destroy it (PBP have expressed no such ambition, rather calling for a left wing Stormont). A serious weakness is the dismissal of Sinn Fein as a “Catholic party,” the green equivalent of the DUP. It is true that this is their mode of operation in the various carve-ups in Stormont, but it does not sum up the party itself or the dynamic of their supporters. Sinn Fein presents itself as a party of the left. Their main demands at the moment – an Irish Language Act, LGBT marriage rights, investigation of state killings, are essentially democratic demands. Their attitude to supporters of unionism is essentially conciliatory, arguing that the political structures can act to reduce sectarianism. When Stormont was operating they were the main conduit of trade union lobbying campaigns. 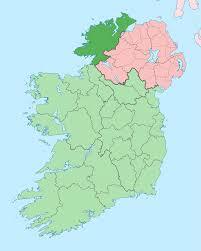 It is not so long ago that the SM blog itself proposed Sinn Fein as a central element of a reformist movement in the 26 county state! To assert that Sinn Fein are two-faced and will not deliver or that they do not represent the interests of workers is one thing. To assert equivalence between them and the full-throated sectarian triumphalism of the Democratic Unionist Party is quite another. Comments Off on Is the six-county state reformable? Dublin South Central Remembers would like to invite you to two events to be held this coming Sunday 1 Octoberto Remember the Rebel participants in the 1803 United Irishmen Rebellion. 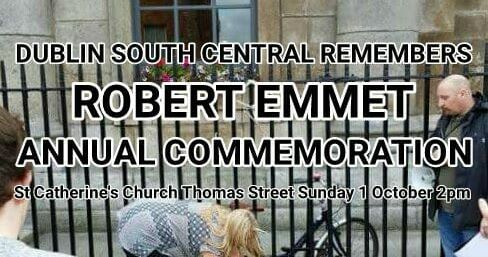 Firstly we will hold a dignified Robert Emmet Remembrance Event at his monument outside St Catherine’s Church Thomas Street at 2pm. 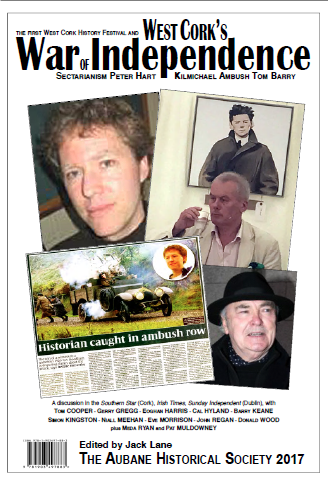 At 3pm, we will be hosting a Public Talk by historian and author Mícheál Ó Doibhilín on Edward Trevor, the “Beast of Kilmainham”, who contributed to the torment and torture of Anne Devlin amongst other political prisoners of the 1798/1803 era. This will take place upstairs in Arthur’s Bar and Restaurant opposite St Catherine’s Church. Much as I admire Bernadette (Devlin) McAliskey she was totally wrong to leave the IRSP in late 1975 and she was wrong about the relationship of the armed and non-armed aspects of the struggle at that time. She has great strengths, but her weakness is that she has never been a party-builder. In 1935, Trinidadian Marxist C.L.R. 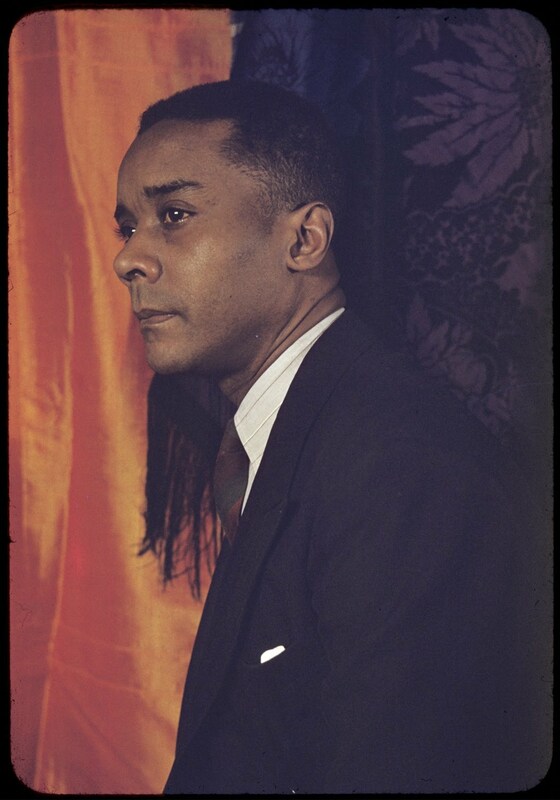 James, a leading figure in the Trotskyist movement in Britain at the time, and an important figure in pan-Africanism, visited Dublin to speak about the Italian invasion of Abyssinia (modern-day Ethiopia). James would meet Nora Connolly O’Brien and the Irish visit would make a significant impact on him. 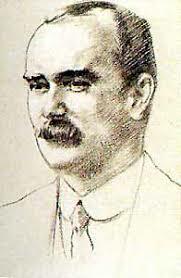 Later he would write about the impact of James Connolly and the 1916 Rising on himself (see here). Well worth reading is the piece Donal Fallon has just written about the visit, see here.